We believe you when you say that you have the skills of an expert assassin! You certainly look like a professional when it comes to infiltration and espionage, and your free-running is unmatched! But even all that isn't going to get you recognized as a prime candidate to join the Brotherhood of Assassins. Nope, sorry, but you need to impress them with your sense of fashion as well. Don't think that all of your training has gone to waste just yet, though. We might have just what you need! 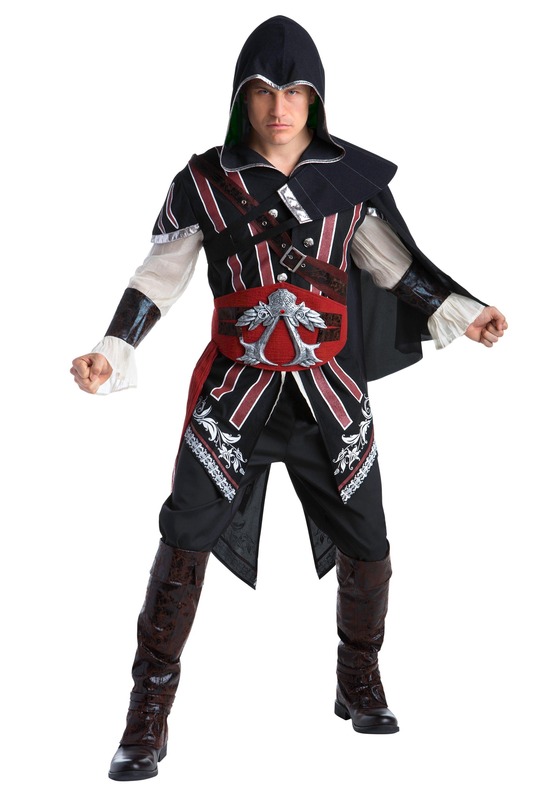 Just take a look at this Assassin's Creed: Ezio Deluxe Adult Costume! Look like a whole new version of the celebrated assassin Ezio when you throw on this black version of his traditional white assassin's uniform. Heck, when you look this good you might get promoted right to the top of the Brotherhood! So you've got the talents of a world-class assassin and, once you grab this costume, you'll have the style of one as well. Now, all you'll need to do is get your hands on the perfect accessories to help you complete any mission the Brotherhood may send you on. Make sure to have dual Hidden Blades, as every assassin knows this weapon is, more often than not, one's ace-in-the-hole to ensuring success on any mission. Grab a few firearms and a trusty sword to have around your waist and you are ready to take the Leap of Faith and become a full-fledged assassin in the Brotherhood!